Twenty-two-year old Christian refugee Suresh Naik is a minority in the Tiangia relief camp of Kandhamal, Orissa’s most vulnerable Lok Sabha segment that goes to polls on April 16. A college student, who lost his home and one academic year to anti-minority violence in the area last August, Suresh is desperate to cast his vote. After days of predicament, the Congress finally seems to have made up its mind on party candidate for key Lok Sabha constituency of Dausa. Priyanka Gandhi today gave the first indication that she was not averse to joining politics and spoke of the possibility of her brother Rahul Gandhi becoming the Prime Minister “one day”. 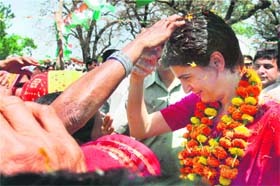 The Congress was quick to welcome Priyanka's statement but would not speculate on as to “when” she would join politics. A bandh called by a students’ organisation would be greeting Congress president Sonia Gandhi in this south Assam hub tomorrow to address an election rally. All Cachar, Karimganj and Hailakandi Students Association has called for a dawn to dusk bandh tomorrow to mar the election rally of Sonia Gandhi at India Club ground here in support of party’s candidate and Union Heavy Industries Minister Santosh Mohan Deb. The Samajwadi Party has stirred a hornet’s nest by opposing English education and computers in its election manifesto. The Congress and the BJP today called for outright rejection of the manifesto while the Left parties were mild in their criticism. The Supreme Court will hear tomorrow a petition filed by BJP candidate from Pilibhit Varun Gandhi challenging the slapping of National Security Act (NSA) by the Uttar Pradesh Government against him for his alleged hate speeches. Politicians in Goa are taking a break from campaigning as the sunshine state gets into holiday mood. Goa’s Catholic Christians, who account for a little below 40 per cent of the state’s population, have been observing Lent in the run up to Easter, which falls today. There are two Jawahars (gems) from Chandauli, who are in news for the wrong reasons. One is 48-year-old Jiwahar, the Pragatisheel Manav Samaj Party candidate, who has 44 criminal cases against him, including seven for murder. Ruling out the Congress or the BJP forming a government on their own at the Centre after Lok Sabha polls, West Bengal Chief Minister Buddhadeb Bhattacharjee today strongly advocated for a Third Front government and said the question of prime ministership could be decided later. Mounting the heat on the leader of the Opposition in the Bihar Assembly Rabri Devi, state JD(U) president Rajeev Ranjan, alias Lalan Singh, will file a defamation case against her for making “derogatory” remarks against him and Chief Minister Nitish Kumar. The Congress party today said the BJP should first dump its leaders Atal Bihari Vajpayee and LK Advani in the Arabian sea, if it feels the Congress is an old party. “The man who made the statement on the old age of the Congress party must implement his statement on his own political party. India may be far from Tibet but not Bollywood as its songs and stars are very popular among the youths of this remote Himalayan region who swear by the names of Shahrukh Khan and Aishwarya Rai. The Supreme Court has held that courts can rely on dying declaration even if a judicial magistrate does not record it. 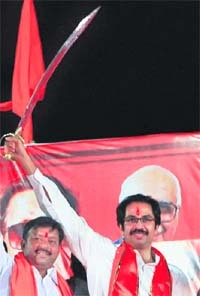 “There is no requirement of law that a dying declaration must necessarily be made to a magistrate and when such statement is recorded by a magistrate there is no specified statutory form for such recording,” the apex court said quoting its earlier observation in the Laxman Vs State of Maharashtra (2002). After the Mumbai attacks exposed chinks in the country's coastal security shield, Naval commanders will for the first time meet at Visakhapatnam tomorrow to review recent measures put in place by the government to prevent recurrence of any such terror strikes. His mother tongue might be Mandarin but this Chinese teacher of Urdu, who is also a poet, believes his adopted language is best suited for poetry. Zhang Shixuan teaches Urdu language at the University of Foreign Studies in Beijing and composes under the pen name 'Intekhab Alam'. A former BJP councillor was arrested here today in connection with the 2002 Naroda Gam post-Godhra riot case, in which ex-minister Maya Kodnani and VHP leader Joydeb Patel are already in custody. Twenty-two-year old Christian refugee Suresh Naik is a minority in the Tiangia relief camp of Kandhamal, Orissa’s most vulnerable Lok Sabha segment that goes to polls on April 16. A college student, who lost his home and one academic year to anti-minority violence in the area last August, Suresh is desperate to cast his vote. He is, in fact, the only Christian - among thousands that were victimised - to have approached the district administration for help in exercising the adult franchise. But he is under pressure to change his mind, with most other Christian refugees in five relief camps resolving not to vote, special security measures by the administration notwithstanding. “We won’t vote until peace returns and we are liberated. The Hindu threat to reconvert continues. They killed my mother last September. No arrests have been made. Safety is a farce,” Prabhat Digal, 19, told The Tribune today at St Catherine School relief camp, located in Raikia block of Kandhamal, where August riots continue to dominate poll discourse, and safety remains a challenge, threatening to affect voter turnout. Even Hindus in Daringbadi and Kotgarh blocks of Kandhamal are this time facing Naxal threat. The area is dotted with Naxal posters, asking Hindus not to vote and demanding the closure of Jagannath temple and Bapu Asaram ashram in Kotgarh. The block just saw the killing of RSS activist Prabhat Panigrahi, prompting Hindu families to plead with the visiting election observers for protection against Naxals, alleged to be Christian sympathisers. “The Naxals have issued an ultimatum to 11 persons involved in the building of Jagannath temple. We are monitoring the situation,” Kandhamal DC Krishna Kumar said. While Hindus are under stress in southernmost Kandhamal, anti-election, anti-Hindu sentiment runs through other swathes of this tribal land, which has seven assembly segments and 73 per cent forest cover. “Most Christians want advancement of polls. 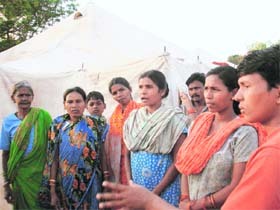 We are not mentally prepared for elections,” says Labanya Nayak of Raikia relief camp. So loud is the communal divide in Kandhamal that one doesn’t have to park anywhere to know which community dominates the area. One just knows - like one knows Raikia is predominantly Hindu. It is such surrogate communal propaganda that is standing in the way of peace in the area. On top of that, the BJP has fielded three staunch Hindu leaders who make no compromises on their religious agenda - Ashok Sahu for the Kandhamal LS seat (evading arrest in a hate speech case), RSS activist Manoj Pradhan from G Udaygiri assembly seat (in jail on eight counts of murder and rioting in the 2007 riots) and sitting MLA Karendra Majhi from Balliguda assembly seat (a staunch Saraswati supporter, alleged to have masterminded anti-Christian violence in his area). Balliguda saw maximum damage last August because it was here in Jalaspeta ashram that Saraswati was killed. Aware of the challenges, the district administration has categorised Balliguda, Udaygiri and Phulbani as “communally sensitive areas”. Balliguda has a sizeable Christian population but Hindus here have created a strong base following Swami’s murder. In Udaygiri, local tribals are opposing the Congress support for ST status for local SC Christians; in Phulbani, the political rivalry between the BJD and the Congress continues, with SC Panos and ST Kondhs deeply divided, with the latter alleging land grabbing by the Panos. District authorities also have a contingency plan ready. “The situation is not normal. But we are prepared. We know Kandhamal elections will be the most watched in Orissa,” the DC said. Nineteen companies of central paramilitary forces are guarding Kandhamal ahead of polls; 4,000 potential troublemakers have been listed are being asked to sign bonds; two MP candidates - Ashok Sahu of the BJP and Nakul Naik of the SP are being tracked for model code violations. Other Lok Sabha candidates from Kandhamal are Rudramadhav Rai for the BJD and Sujit Padhi for the Congress. Rai is a sitting MLA from the Daspalla segment in Kandhamal, is a traditional BJD stronghold. Four independents are in the fray - all SCs; not a single tribal is contesting in the segment, which has been de-reserved. Kandhamal has 54 per cent tribal population, but no tribal political representation. The ruling party has made it clear that its first choice is tribal leader Kirori Lal Meena, whose five legislators are supporting the government. “We would like Kirori Lal to contest from Dausa and would think of other option only if he declines,” Chief Minister Ashok Gehlot said. As far as the Congress’ other option is concerned, political circles are abuzz with the talk that the party is all set to field ADGP (law and order) Lakshman Meena in case Kirori refuses the offer. However, no official announcement has been made in this regard as sources say the process regarding his voluntary retirement is yet to be completed. A 1982-batch IPS officer, Meena has held key posts like the IGP of Kota and Bikaner range, DIG of Jodhpur and Bikaner range, and the SP of Jalore, Ganganagar, Ajmer and Alwar. On the other hand, a miffed Kirori Lal has accused the Congress of misleading the people by asking him to contest on the party ticket. “The Congress is well aware of the fact that being an Independent MLA I cannot contest the Lok Sabha elections on the party ticket as it will lead to my disqualification. Instead of offering me the party ticket, the Congress should clarify whether it is ready to support my Independent candidature from Dausa,” he stated. When asked as to whether he would field his own candidates now, Kirori Lal said he was keeping all the options open and would come clean on his stand once the clear picture emerges on the Congress’ move vis-à-vis Dausa seat. Meanwhile, in another development, there are reports that the BSP, whose all six MLAs were roped in by the ruling Congress, is also trying to woo Kirori Lal. A delegation of BSP leaders has reportedly met the tribal leader. Political observers opined that if Kirori gave a positive response to the BSP’s feelers, the two could form a formidable alliance, particularly in east Rajasthan where Meenas are a dominant force and the BSP too has support in the region due to its proximity with Uttar Pradesh. Priyanka Gandhi today gave the first indication that she was not averse to joining politics and spoke of the possibility of her brother Rahul Gandhi becoming the Prime Minister “one day”. The Congress was quick to welcome Priyanka's statement but would not speculate on as to “when” she would join politics. “As I am growing older, I’m realising that ‘never’ is a bad thing to say. So I’m not going to say never,” 37-year-old Priyanka, who had till now clearly refused to join politics and had only campaigned for her mother Congress chief Sonia Gandhi and brother, told reporters here. However, she added,”...but I certainly don’t see it. I don't feel that (joining politics) is what I would do.” Priyanka said Rahul, who was contesting from Amethi, was qualified to be the Prime Minister, but Manmohan Singh would assume the post again if Congress won the Lok Sabha polls. “I have full faith in my brother. He is hardworking. He means well. He is, according to me, qualified.... So, one day he will. He will do a good job of it,” she said, when asked whether she thought her brother was qualified enough to hold the top post. Asked to comment on BJP's criticism that Manmohan Singh was a weak Prime Minister, Priyanka said: “Manmohan Singh is a very qualified Prime Minister. The country has seen his ability. He remains firm. I don’t think he is weak at all.” Reacting to Priyanka's statement, Congress spokesman Abhishek Shinghvi said she was "already a part of the larger Congress family”. A bandh called by a students’ organisation would be greeting Congress president Sonia Gandhi in this south Assam hub tomorrow to address an election rally. All Cachar, Karimganj and Hailakandi Students Association (ACKHSA) has called for a dawn to dusk bandh tomorrow to mar the election rally of Sonia Gandhi at India Club ground here in support of party’s candidate and Union Heavy Industries Minister Santosh Mohan Deb. The students association has called for the bandh to register their protest against failure of the UPA government to remove the communication bottleneck that South Assam area is suffering from in view of non-completion of railway gauge conversion project and the four-lane East West Corridor project of National Highways. Both the projects have overshot the deadline by years. However, Congress spokesman Dipan Dewanji said that the Congress president would address the election rally here on schedule despite the bandh call given by the students association. He asserted that the bandh would be defied by the people of Barak Valley areas and would definitely attend the election rally. The Congress candidate, Deb, who has represented the Silchar constituency in the Lok Sabha for four terms, is facing a stiff challenge from BJP candidate Kabindra Purkayasthya and Assam United Democratic Front candidate Badrudding Ajmal. The constituency has a mixed population dominated mostly by Muslims and Bengali-speaking Hindus. Sonia Gandhi is also scheduled to address election rallies at Shillong (Meghalaya), Imphal (Manipur) and Itanagar (Arunachal Pradesh) tomorrow. The Samajwadi Party has stirred a hornet’s nest by opposing English education and computers in its election manifesto. The Congress and the BJP today called for outright rejection of the manifesto while the Left parties were mild in their criticism. “A manifesto like this which seeks to drag India into the stone age must be condemned and rejected,” Congress spokesman Abhishek Singhvi said. A senior BJP leader said the manifesto was not in tune with the present day realities and was primarily aimed at appeasing the minorities. CPI leader D Raja said there was no rationale in opposing English and computers in the world today. ‘’English has come to stay in India and a world without computers is unimaginable now,’’ he underlined. The Samajwadi Party, facing indignation over its election manifesto, was on the back foot today with party general secretary Amar Singh clarifying to the media that the party was not ignoring the present day needs while maintaining that they could not be promoted at the cost of jobs for the masses. 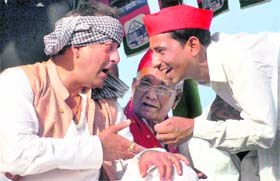 He said the Samajwadi Party was not speaking of a ban on either the language or the use of computers. Singh said the party was against the “compulsory usage of English” in public dealings and added that promoting regional languages did not mean discouraging English. The Supreme Court will hear tomorrow a petition filed by BJP candidate from Pilibhit Varun Gandhi challenging the slapping of National Security Act (NSA) by the Uttar Pradesh Government against him for his alleged hate speeches. The matter will be heard by a bench headed by Chief Justice K G Balakrishnan, which on April 2 had issued notices to the state government and the District Magistrate of Pilibhit on the allegation by Varun that NSA was invoked against him with a political motive to sabotage his electoral debut. However, the Uttar Pradesh government has refuted the allegations of the 29-year-old BJP leader, saying NSA was invoked against him for his communal speeches and the chaos created by him while surrendering before a court in Pilibhit in connection with the cases registered against him. In its 35-page response to the notice issued by the apex court, the state government said the inflammatory statement by Varun and the manner in which he surrendered on March 28 amounted to breach of public order, warranting invocation of the NSA against him. Politicians in Goa are taking a break from campaigning as the sunshine state gets into holiday mood. Goa’s Catholic Christians, who account for a little below 40 per cent of the state’s population, have been observing Lent in the run up to Easter, which falls today. Most of the devout abstain from celebrations and parties and festivities are postponed till after Easter Sunday. Goa has been enjoying a long spell of holidays since Good Friday fell on Friday. Prayers and family gatherings have taken the most of Holy Saturday and Easter Sunday in South Goa where the majority of Goa’s Catholics live. Since Ambedkar Jayanti falls on Tuesday, again a public holiday here, people, particularly government employees, living in Goa’s main cities have taken a long weekend off. “Campaigning will be on full swing from April 15 when Sonia Gandhi addresses her public meetings in Goa,” says senior party leader Vijai Sardessai. The coming week will see a hectic political activity, as the BJP, too, has roped in Gujarat Chief Minister Narendra Modi to address a rally in the Hindu-dominated town of Ponda on Wednesday. Even the BJP, which kicked off its campaigning earlier this month, has taken a break as voters in the main towns and cities of Goa have left for their villages. Even the Nationalist Congress Party (NCP) has rescheduled its election campaign around the holidays. The party, which is contesting the North Goa parliamentary seat in alliance with the Congress, has postponed a planned rally by its leader Sharad Pawar. In other words, Goa will see a concentrated burst of campaigning from Wednesday for about a week. There are two Jawahars (gems) from Chandauli, who are in news for the wrong reasons. One is 48-year-old Jiwahar, the Pragatisheel Manav Samaj Party candidate, who has 44 criminal cases against him, including seven for murder. The other is Jawahar Lal Jaiswal, the BJP candidate, who has declared assets worth Rs 33 crore from this most backward Naxal -affected district. This district separated by Bihar by the Karmanasa River has seven candidates with criminal records and three who are multi-crorepatis. It provides a bleak picture of poverty, criminals and money power in this district often shaken by Naxal violence. Besides the BJP candidate, even BSP’s Kailashnath Singh Yadav has declared assets of Rs 3 crore. Tulasi, who belongs to the Suheldev Bhartiya Samaj Party (SBSP) also owes assets over Rs 4 crore. As Chandauli has the highest number of criminal candidates for a single seat among the 16 constituencies going to the polls in the first phase in the state on April 16, it has been declared as a red alert constituency by the Association for Democratic Reforms (ADR) and the National Election Watch. According to an ADR and the National Election Watch report, 46 of the state’s 268 candidates (17.16 per cent) in the fray during the first phase have a criminal record. The report was prepared after analysing 1,440 affidavits of candidates contesting in 11 states. Chanduali is however, just one of the nationwide 38 red alert constituencies for having 3 or more contesting candidates with criminal backgrounds. The report has identified seven such red alert constituencies in UP in the first phase alone . Besides Chandauli having 7 criminal candidates, there is Ghosi (5), Kushi Nagar (5), Ghazipur (4), Mirzapur (4), Varanasi (3) and Bansgaon (3). Incidentally, 13.06 per cent of the candidates (35 of 268) in the first phase also happen to be crorepatis. It is ironic as the region going to the polls is one of the most backward regions, including Purvanchal and the Naxal impacted districts, bordering Bihar. The second richest in this phase is Gorakhpur’s BSP candidate Vinay Shankar Tiwari having assets worth Rs 16 crore. 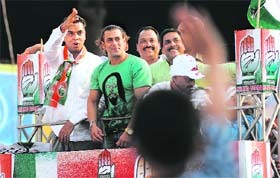 He is the son of former mafia don-turned-politician Hari Shankar Tiwari. The constituency has two more crorepatis - SP candidate and Bhojpuri actor-singer Manoj Tiwari (5 crore) and Manoj an independent, having assets over Rs 4 crore. The high profile BJP scholar politician Dr Muli Manohar Joshi from Varanasi has both a criminal record as well as assets worth Rs 5 crore, the report points out. Parywise, both the BJP and the BSP have 3 crorepatis each, the Congress has 2, SP one, 2 are indpendents, one belongs to the Apna Dal and another to the SBSP. The ADR and the National Election Watch, a nationwide campaign comprising more than 1,200 NGOs and other citizen organisations have been working on electoral reforms, improving democracy and governance in India has prepared the report. “The Congress or the BJP cannot form government on their own. The parties (in the Third Front) who have joined hands with us are more in number. We are not running after any leader. The question who will be the PM can be decided later. Why can’t those parties come together on the basis of a set of programmes?” Bhattacharjee asked during an election meeting at Jadavpur. “We want a government at the Centre that will work for the poor, give more power to the states, follow independent foreign policy and which will not compromise on the question of secularism,” he said. Bhattacharjee said the Central government should not be “vacillating like the Congress that did not take action when Babri Masjid was raged to the ground”. Mounting the heat on the leader of the Opposition in the Bihar Assembly Rabri Devi, state JD(U) president Rajeev Ranjan, alias Lalan Singh, will file a defamation case against her for making “derogatory” remarks against him and Chief Minister Nitish Kumar. JD(U) national spokesman Shivanand Tiwari told reporters at the party headquarters here that Lalan would approach the court in his individual capacity tomorrow. All formalities for filing the defamation case against Rabri Devi for making the remark at an election rally at Chapra recently had been completed. The JD(U) had earlier lodged a complaint with the EC about the remark demanding that Rabri should be banned from campaigning and her membership from the Bihar Assembly be terminated. The Congress party today said the BJP should first dump its leaders Atal Bihari Vajpayee and LK Advani in the Arabian sea, if it feels the Congress is an old party. “The man who made the statement on the old age of the Congress party must implement his statement on his own political party. First he should dump Vajpayee and the oldest man who is in hurry to become Prime Minister LK Advani in the Arabian sea,” All-India Congress Committee general secretary B. Hariprasad said here. Hariprasad was responding to the statements of BJP leader Narendra Modi during Karnataka campaign wherein he appealed the people to discard the Congress because it is an old party. “The culture of a person, society or nation is measured on how they treat children, women and aged people,” he said condemning Modi during the media briefing in Margao here. He said the Congress strongly believes in the tradition and heritage of the country. The new generation Tibetan youth, who love to dress in jeans, drink cocacola or go to a disco, love to listen popular Hindi songs like “Pappu can't dance saala” or “It’s the time to disco..” and wear kurta with capris. “I love Hindi songs. I may not understand them but I like the beats and rhythm. They are real treat,” said Sounag Gentsen, who works with the Tibet Autonomous Region administration. The DVDs and CDs of Bollywood movies and songs are easily available in the music shops of Lhasa’s busy streets like North Nyngthan or Barriku. Most of them are allegedly smuggled into China through either Nepal or Hong Kong and are available at a price between 10 to 20 Yuan (Rs 70 to Rs 140 range). “The peppy Indian numbers just drive us crazy. They have a fresh effervescence,” said Dechu Dekyi Chudrun, who is currently pursuing her engineering degree in Sichuan province, said. Many Tibetans love Bollywood stars so much that posters of Shahrukh, Aishwarya or Preity Zinta are easily spotted in homes, shops and city buses. It is not only the songs and stars but also salwar kamiz that is so popular among the young Tibetan girls. “I have two pairs of the Indian dress. It is my prized possession and I wear them on special occasions like birthday or parties,” a 20-something Tibetan girl, who identified herself with her English name Diana, said. She, however, could not say properly whether the Indian dresses are made in China itself or come from India. There are many Tibetans, who have never seen a saree in real, but like it very much and are crazy to own one. The Supreme Court has held that courts can rely on dying declaration even if a judicial magistrate does not record it. “There is no requirement of law that a dying declaration must necessarily be made to a magistrate and when such statement is recorded by a magistrate there is no specified statutory form for such recording,” the apex court said quoting its earlier observation in the Laxman Vs State of Maharashtra (2002). A Bench of Justices Arijit Pasayat and Asok Kumar Ganguly said a dying declaration could be oral or in writing or by the means like words or signs. When it is recorded, no oath is necessary nor is the presence of a magistrate absolutely necessary, the apex court said. The Bench passed the ruling while setting aside a Rajasthan High Court judgement, which had acquitted Champa Lal, who murdered his wife Panni Devi on December 11, 1995 by setting her ablaze. The Jodhpur Sessions Court convicted and sentenced Champa Lal to life imprisonment, but the high court on an appeal acquitted him of the charge on the ground that the dying declaration was recorded by the SHO, Joga Ram. The apex court also asked the convict to surrender to serve the reminder of sentence, if any. Though Panni Devi stated in her dying declaration that Lal set him ablaze after accusing her of having a number of paramours, the high court felt that since the statement was recorded in the absence of a magistrate, it could not be relied upon for convicting the accused. 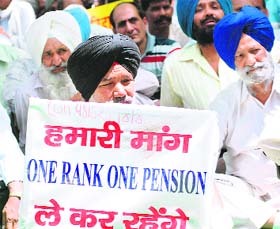 Aggrieved, the state moved the apex court. The apex court said the high court had erroneously discarded the dying declaration despite the fact that it was recorded by the police officer in the presence of a doctor. The Bench further said the dying declaration was also supported by the statements made by certain eye witnesses, who rushed to the rescue of the victim after she was set ablaze by the accused. “That being so, the appeals deserve to be allowed which we direct. The judgement of acquittal passed by the high court is set aside and that of the trial court is restored. Though the Naval commanders' conference is a bi-annual affair, the present meeting at the Eastern Naval Command assumes significance as the government had in February this year appointed the Navy as the overall head of the maritime security apparatus. The conference will discuss "the Mumbai terror attacks and its fallout, apart from reviewing the progress made in setting up the security net desired by the government and planning for the future," a Navy officer said here today. Navy chief Admiral Sureesh Mehta will chair the meeting in which the force's acquisition plans would also be discussed. The plans include both the short-term, fast-track acquisitions such as fast patrol craft approved soon after the Mumbai attacks, and the long-terms plans for acquiring large warships such as destroyers, frigates, corvettes, submarines and aircraft carriers. On February 28, the government had entrusted various agencies, including the Coast Guard, Shipping and Petroleum ministries, with the responsibility of coordinating the task of securing the 7,500-km-long coastline, and also the innumerable ports and offshore installations of oil companies. In the capital to attend an annual 'mushaira,' Zhang says, "In Urdu, there is a strong tradition of poetry. While it might be easy to conjure up poetry in this language, the same at times gets difficult in Chinese or English." While Zhang was pushed into studying Urdu because the government of China needed experts in the language, it opened up the world of Ghalib, Mir Taqi Mir and Zauq to him. Pursuing journalism way back in 1965 and also studying Russian, Zhang was moved to studying Urdu by his teacher as part of the policy of the government, which needed people trained in the language to be employed in its embassies, radio networks and other departments. "Since the language has a strong tradition and history of poetry, there is plenty to read and get influenced from," Zhang, says. Today, there are four universities across China that teach Urdu and over 200 students enrolled in the language courses, he adds. United by their love for Urdu, as many as 20 distinguished poets from six countries assembled in the capital to be part of the Jashn-e-Bahar mushaira. Also part of the literary gathering were poets from Afghanistan, Saudi Arabia, the US and the UK, besides Pakistan. "While I write compositions in Arabic, the similarity of its script to Urdu makes it very easy to translate the poetry," says Omar Salim M Al-Aidroos, an Arab poet of Urdu from Jeddah. Al-Aidroos, who is a lawyer by profession has been travelling to India since the last 10 years to participate in such gatherings with sponsorship from the Saudi Arabian government. The Indian poets, who were part of the ensemble included Shahryar, Wasim Bareilvi, Gauhar Raza and Alok Srivastava among others, the foreign participants included Afghan poet Rahbin Khorshid, besides Al-Aidroos and Zhang. David Matthews from London, Masroor Javed from New York and Ambareen Hasib from Karachi also took part. "Urdu is a language, in fact a culture, that was born in and around Delhi and it is amazing to see how it has spread across the world through the Indian diaspora," said Kaamna Prasad, founder of the Jashn-e-Bahar trust that organises the event every year. “The Naroda police has arrested Vallabh Patel after the Special Investigation Team (SIT) submitted absconders’ list in the riot cases to them,” SIT officer PL Mal said. “We have received a message from the Naroda police confirming that they have arrested Patel, who was absconding,” he said. The SIT was formed by the Supreme Court to investigate some of the post-Godhra riot cases. Patel had got anticipatory bail from a local court after his name was shown in the list of absconders in the chargesheet filed by SIT in December 2008.